With President Asif Ali Zardari and Prime Minister Yousaf Raza Gilani sending out flood relief appeals a little too late, chances are that it will be another 20 days before the donors mobilise their resources. With the national disaster management authority chief being quoted as saying that it will be another 90 days before water is drained out of districts Badin, Sanghar and Mirpurkhas, it will be a long time before the flood victims are rehabilitated. Meanwhile, relief is still a long way for thousands living under the open sky and braving the harsh elements of the weather. This picture was taken at a state run relief camp situation next to the Naukot Fort in District Tharparkar. 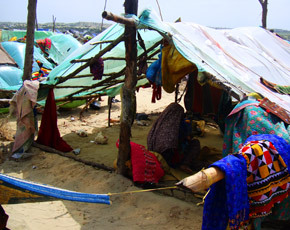 Made using plastic sheets and dried sticks, the makeshift tents are home to thousands of flood victims who fled from Districts Badin, Sanghar and Umerkot. According to PDMA Sindh, 625, 293 displaced persons are living in similar government-built relief camps across the province. Providing one meal a day to the victims, the state says it’s doing its bit and hoping that the donors will step forward to help. Meanwhile the president has asked for special prayers, hoping for divine intervention in a man-made disaster. What happened to the constitutional right of the state being responsible for the safety and well being of its citizens? Sindh is a very peaceful region and there peoples have not hatred India as such many sindhi still living in India. we have very crucial situation nowadays, natural disaster and corruption have worsen the situation. government can nothing do because its institutions are most corrupt peoples can’t rely the these. Ngo sector and civil societies can play better role for the welfare of the people in critical situation. It’s very unfortunate to see what is happening in Pakistan. My heart sinks down when I see pictures of little children being left unfed. We Indians should do something about it, India should do something to help. May be we have history of not being friendly but we share the same soul, we all know that. We are so close to each other than the rest of the world and yet are so seperated. Pakistan had been used by different countries, china being next in line. They would not help them without interest (a single Uighur incident and all that was in past was laid to rest). China only needs allies against US, Pakistan to counter INdia. THis is the time INdia should rise up and claim those who are it’s own or were once it’s own. We all have to wake up before the moment it all happens to us. Its very simple ”Not to do any thing against your heart”. And remember one thing when the Nation of Moosa was stranded in a desert having no place to habitat, it was the new young generation who then fought for their rights and then Allah help them to win land to live in. My teacher used to say that ”if you dont find any good person to vote, then still vote for a person who is better in them. If you leave that vote, fair chances are that it will be casted wrongfuly to a person who you dont like the most”. It is about time Pakistan just asked India for help. It is not about who is better. It is just about saving people who are going to go through a great deal of suffering and death if nothing is done now. This is not about money. It is about more tangible things which are in easy reach across the border. I fully endorse Bilal. Remember, an average Indian doesn’t hate an average Pakistani though we realize that yours politicians and Army generals have screwed your country big time just as some of our own politicians. Please think of leaving a better future for your children than you got from your parents and not worse. Hatred towards the neighbour hasn’t gotten Pakistan anywhere. It is still time think so that the whole region can prosper. Ha! Constitutional rights? Do you even think those poor people know the rights? Do you even think our dear president feels in his heart he has a constitutional obligation? When will our nation wake up and have some dignity? the government has’nt any interest in the welfare of its citizens. they are doing all for their own pockets. the more aid they get from donors the more money they send to their foreign accounts. Material efforts will solve only material problems, and spiritual efforts will solve spiritual problems. Period. Thank you Nitin for your sentiments but people should hold the government accountable – Government will never have a reason to do anything if people come forward and take care of the situation. power of prayers was always a tool of gaining the un-ending support from ALMIGHTY ALLAH, but it in my opinion people deserve complete attention and care from govt side as well as civil societies should come forward to provode relief to the rain-hit people of sindh. some on told me that power ful not ables of some areas are trying to use relief goods for making their good reputation so that they should be succeded in coming elections and if this is true then distribution of relief goods should be assignment of PAKISTAN ARMY. If prayers could replace planning, Pakistan would never suffer from the aftermath of natural disasters. I am sure there are many NGOs and private charities in Pakistan doing remarkable work for flood relief. In the US, check out Appna.org. It coordinates various relief efforts and long term health and infrastructure projects in Pakistan. Also UNICEF (for people outside pakistan) is a great place for donations. I am sure Allah will save our beloved country soon. Here the point is not the poverty of those affected, it is the wealth and richness of elite class in the country comprising of politicians, bureaucrats, big businessmen and industrialists who enjoy all the luxuries in the world whereas these poor affected masses don’t have two square meals or a roof over their head. When the gap becomes so wide things start falling down. There is urgent need to fulfill the basic needs of the flood affected people while their rehabilitation efforts continue. he says if donot collect extra means,money this should have been distributed among the people require them most…!! Very unfortunate! I wish no human being on this earth should sleep empty stomoch any day. No religion, country, politics should come in way in such simple expectation. Please do something for them.